‘Fruit, small; roundish turbinate. Skin, smooth, pale green, becoming yellowish green at maturity, with dull red next the sun, strewed with whitish grey dots. Eye, open, and set in a deep basin. Stalk, half an inch long, stout, inserted in a small cavity. Flesh, white, half-melting, juicy, with a sweet and musky flavour. A dessert pear; ripe in August.’ [Hogg – Fruit Manual p.625/1884]. Pear of English origin. [Pears of New York p.486]. Don describes it in 1831. I have no further information on its origins. Figured in Pomona Brittanica, the illustration used here. [PB pl.LXXXIII/1812]. 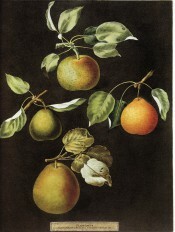 Listed only in the 1857 catalogue in an Addendum as ‘Beurré Orange ditto’ [Pear no.46/1850]. In a copy of the 1857 catalogue the number ‘46’ is changed to ‘37’. Elsewhere such changes were made to align with the diary numbering but there is no diary entry for this pear. Obtained from Veitch’s Nursery, probably the original Exeter premises. Pear ‘Orange Bergamot’ | PB pl.83/1812. Orange Bergamot is the medium orange pear at centre right.